hensive oral anti-hyperglycemic for the management of Diabetes Mellitus. AMREE PLUS is a comprehensive oral anti-hyperglycemic for the management of Diabetes Mellitus. It also helps delay triopathic complications associated with diabetes due to its Plus effects in toning the system. AMREE PLUS is a synergistic mix of active constituents from nature’s herbs that have been used all over the world from times immemorial. The formulation is specifically designed to provide comprehensive benefits w.r.t. glucose metabolism, insulin production and utilization, lipids metabolism as well as to alleviate the symptoms like fatigue, weight loss, excessive thirst etc. It Exerts insulin mimic effect due to the polypeptide derivatives that resemble insulin in structure and action. It Tones the islets of pancreas to regularize the secretion of insulin. Does not enhance insulin release in subjects under normal glycemic conditions but enhances the release in diabetics. It Delays the absorption of glucose from gastro-intestinal tract due to the soluble dietary fibers present in its ingredients. It exhibits inhibitory action against glucose uptake in small intestine of experimental subjects. Amree Plus also suppresses selectively neural response of sweet taste stimuli on tongue. It activates the liver for effective glucose and lipid metabolism. Bio-chemical studies suggest that Amree Plus increases sensitivity to insulin. 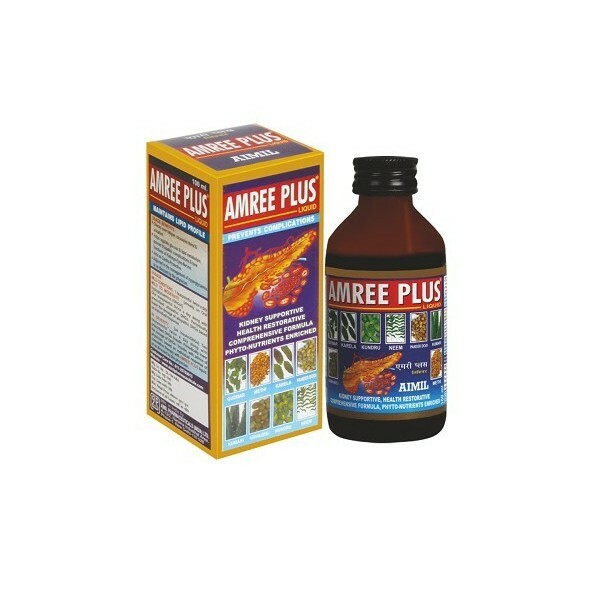 Amree plus acts as System Toner by regularizing the cholesterol level, exerting anti-oxidant & immuno-modulatory role. glycosides, tannins, several micronutrients etc. It is Synergistic to oral anti-hyperglycemic & insulin therapy. Amree Plus decreases the release of glucose into the blood from glycogen, fats and proteins and simultaneously enhances the formation of glycogen and fats from glucose in the blood. This helps to maintain the plasma level of glucose. Amree Plus cannot substitute insulin but it can reduce dependence on insulin by stabilizing or by reducing the dosage of insulin. AMREE PLUS is free from the risk of hypoglycemia (Low Blood Sugar). Amree Plus delays the deterioration of the already established complications like Neuropathy, Nephropathy, and Retinopathy. The clinical trials prove that adjuvant therapy with Amree Plus show better results than OHGs (Oral Hypoglycaemics) alone. Amree Plus provides Natural Bioflavonoids like Quercetin and catechin, glycosides, tannins, several micronutrients etc. thus acts as cardio protective and pancreotropic. Amree Plus is very useful as a cardio protective due to its cholesterol lowering & anti-atherosclerotic activities particularly in diabetic subjects as they are more prone to have cardiac illnesses. It is Immuno-modulatory and anti-allergic. Amree Plus has been clinically studied at various prestigious medical institutions e.g. AIIMS (New Delhi), A&U Tibbia Medical College & Hospital Delhi University, Endocrinology Lab (Dr, G.P. Sharma) Safdarjung Enclave Delhi, Aggarwal Hospital (Delhi). Checks over fatigue ,excessive thirst and urination. Helps regulates glucose and lipid metabolism. Adjuvent in management of diabetes mellitus. 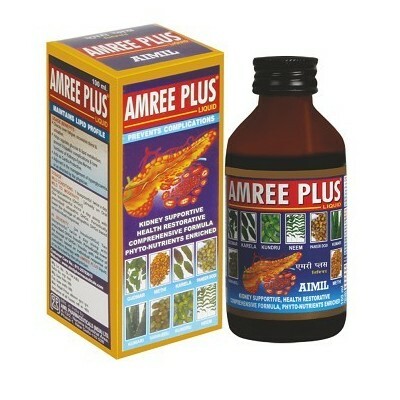 • Should start Amree Plus in dosage 1/3-1/2 teaspoonful (2- 3 gms) twice or thrice a day, preferably 1/2 hr. before meals. • Periodically check the blood sugar and follow the diet routine & life style as recommended by physician. 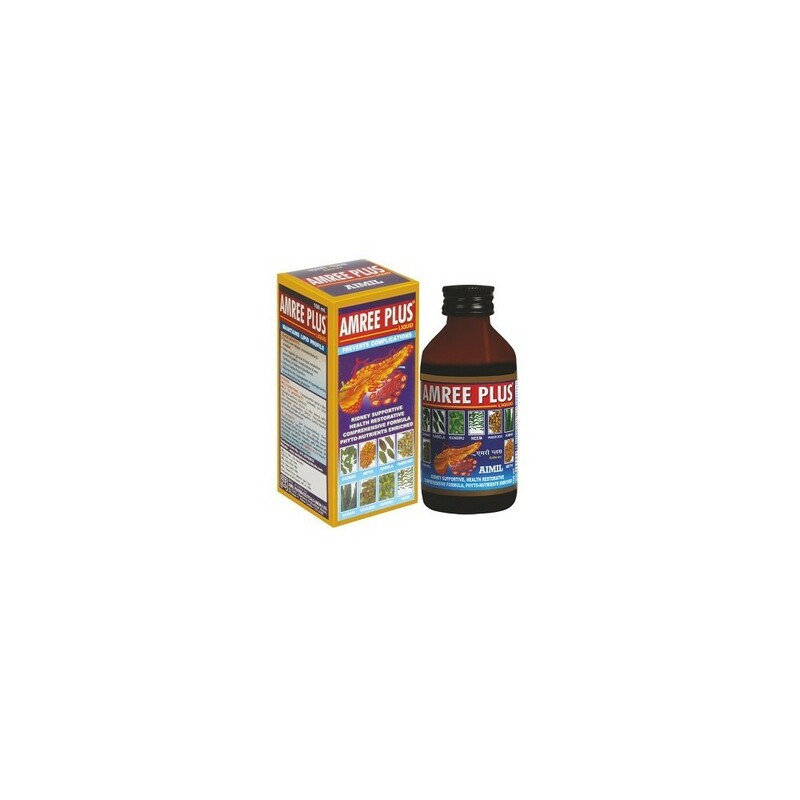 • Start Amree Plus in dosage of 1/2 teaspoonful (3 gms) twice or thrice a day, before meals initially along with recommended allopathic medicines if any. • Periodically check the blood sugar and observing anti-hyperglycaemic response, gradually lower the dosage of allopathic medicines till completely withdrawn. • Should follow the dietary recommendations & life style advisable for diabetics & consult the physician. • Maintain insulin/allopathic therapy, initially. • Start Amree Plus therapy in the dosage of 1/2- 1 t.s.f. (3-5gms) twice or thrice a day, preferably 1/2 hr. before meals. • Periodically check the blood sugar and on observing additional anti-hyperglycaemic response gradually lower the units of insulin or dosage of allopathic medicines. • Continue the dietary recommendations & life style advisable for diabetics and consult the physician periodically. 1 Tablet twice a day, preferably 1/2 hr. before meals. 1 Tablet thrice a day, preferably before meals along with prescribed allopathic OHG. Periodically lower the dosage of allopathic OHG based on individual response. Granules: Sealed plastic container of 100 gm. Amree Plus is not associated with side effects on short / long term in therapeutic recommended dosage. Still, if a patient suffers from any discomfort with intake of AMREE PLUS usage must be stopped and professional consultation should be taken.